During our communal era, each Amana village had a bakery that would supply bread to the numerous communal kitchen houses. A pile of wood kindling was stacked by each bakery. The baker would use this to stoke the brick oven and then let the flames burn down until the bricks lining the oven cavity where sufficiently hot. At this point they raked the coals out of the oven and would then start the baking with the loaves of bread, placing them skillfully in the oven cavity. A large peal would be used to reach all parts of the oven which took skill in itself. This was as much an art as anything else as the oven was large and the baker had to maneuver the peel with the hands of a surgeon.T hey baked 3-4 pound loaves, the European type with the very crispy crust and the oh so soft center. Once they cooled, they would be delivered throughout the town. Cafe cakes went into the oven on trays and after the bread. They were not to have a crispy crust. Today only one original bakery still survives. 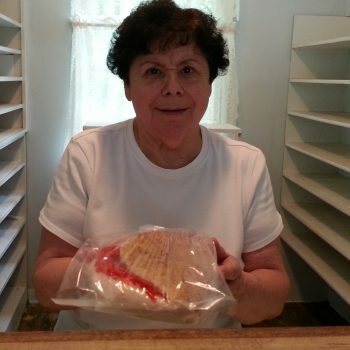 Located in Middle Amana, the Hahn Hearth Oven Bakery is operated by Doris Hahn. Doris still gets up in the middle of the night to start the oven and mix the dough just as she has for years. For a more uniformed heat, the oven was converted from wood to gas over the years. Doris married into the Hahn family and carries on the tradition of baking that began in her family back in the communal era. You’ll find she is using some of the same recipes that were used a century ago. The bakery is a great place to start your day but you’ll want to get there early or call ahead and have a coffee cake reserved as they are almost always sold out by 10 am. This is a low tech operation. Don’t expect to go online and check out their products. Give her a call and tell her you want a coffee cake. She’ll ask you some questions about which one. The are two basic types, filled or unfilled with a sugar topping (streusel). The filled will be similar in appearance to a jelly roll but much better. It’s a yeast dough and not a cake. It comes with a variety of fruit fillings or cinnamon. The coffee cake with the sugar topping is known in Middle Amana as Zuckar Kuchen or sugar cake. It is a yeast dough that is topped with streusel. A lot of streusel, hence the name. They are both wonderful and each is different. So if you are concerned about your sugar intake the choice should be simple. Doris still bakes bread and cookies but for me it’s the coffee cakes that take me back to my childhood.